In the summer of 1993, “De Wandelgek” walked among the reindeer on the Kungsleden trail. The ‘Kings trail’ – Kungsleden – is the most famous long distance hiking trail in Sweden. The official route of about 450 km runs from Hemavan (near Tärnaby) in south-west Lapland to Abisko in northern Lapland. There is also a piece of Kungsleden more south in Sweden, namely in the fjäll region around Sälen, Fulufjället & amp; Grövelsjön. But the real Kungsleden, as he is internationally known, runs from Hemavan to Abisko. At regular distances (depending on the route) there are fjällstations, huts to stay the night, huts that sell provisions, … There are routes where you have to cross lakes with boats (whether manual or motorized). The Wandelgek has covered the 105 km long route from the Abisko Turist Station to the Sami village of Nikkaluokta, where the journey from the Turist Station to the Singi huts is counted to the Kungsleden (72 km). 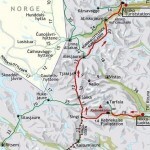 In addition there is a route from the Singi huts via the Kebnekaise Fjällstation to the Sami village Nikkaluokta of 33km. The route, consisting of 7 daily stages, was completed in 6 days. The diagram below shows in reverse order the course of altitude during the traveled trek. The highest point of the trip was the 1100m high Tjäktja pass. During the trip the Wandelgek was provided with a backpack with about 19 to 20 kilos of ballast. Prior to the walking tour of the Kungsleden, “De Wandelgek” supplied provisions in Abisko and the nearby environment explored from Abisko and the Turiststation. Nearby was also a beautiful, 20 meter deep gorge (the Abisko canyon) worn out by the Abisko River, which then flows into Lake Törnetrask. 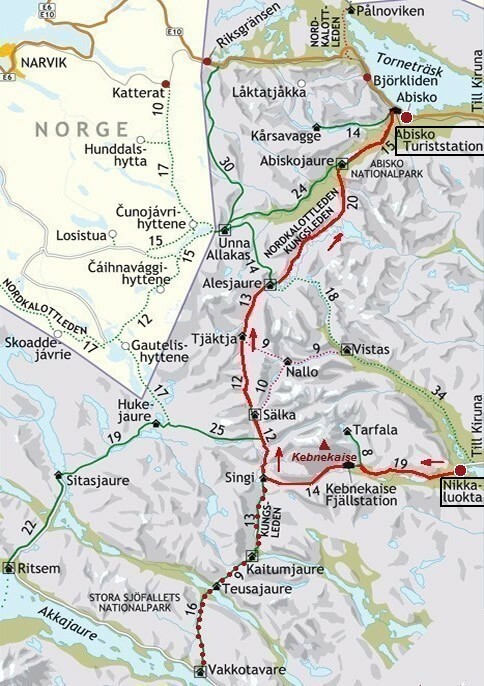 Stage 7 : Kebnekaise Fjällstation – & gt; Nikkaluokta 19km.